With 1968’s Planet of the Apes proving a hit for studio 20th Century Fox, a sequel was inevitably commissioned leading to the release of Beneath the Planet of the Apes in 1970. Clearly weaker than its predecessor, Beneath is still a highly entertaining follow up with plenty to enjoy, retaining much of what made the original Apes a success. With Charlton Heston only agreeing to return in a reduced role as the human astronaut Taylor, the lead position is filled by James Franciscus playing the part of Brent, the sole survivor of another space expedition to find himself in a world ruled by intelligent apes. Whilst it’s a shame that Heston didn’t agree to a larger role in the film, Franciscus carries the lead ably and provides a suitably intense performance as the bewildered astronaut struggles to comprehend the reality of his situation and the revelations of the apes’ world. Brent is joined by the mute human, Nova (with Linda Harrison reprising her Planet of the Apes role) as the pair search for the vanished Taylor leading to a reunion with chimps Zira (Hunter) and Cornelius (with David Watson taking the place of Roddy McDowall who was unavailable at the time). Maurice Evans returns as Dr. Zaius, this time debating the war plans of James Gregory’s Gorilla General, Ursus (a role turned down by Orson Welles) – pressing for the elimination of humankind and the conquest of the mysterious ‘Forbidden Zone’. Although the script does at times lean towards illogic and convenience (audiences in 1970 were less prone to nitpicking and more open to simply being entertained), like its predecessor, Beneath the Planet of the Apes is laced with social commentary featuring clear protests against issues such as the conflict in Vietnam and Nuclear warfare. There are also some neat science fiction ideas as Brent ventures beneath the surface and discovers a colony of telepathic humans, it’s perhaps a little comic book in execution but all part of the charm. Roddy McDowall is also sorely missed, David Watson isn’t a bad substitute but it was the delightful subtleties of McDowall’s performance that made Cornelius such a standout character in the original Apes. Director Ted Post keeps things moving along at a decent pace, making the action sequences suitably exciting and tense and allowing ample time for viewers to appreciate the creative set design, which is once again laudable (the underground ruins are particularly effective) given the relatively low budget. What’s notable about Beneath is that it’s somewhat darker and more adult than the previous Apes film, although a scene involving a half-ape/half-human child was deemed too controversial and eventually dropped, there is a higher level of violence on display particularly in the action-packed, blood (well, the customary red paint which was commonplace in film and television of the sixties and seventies) spattered finale and an overall sense of doom and finality to proceedings. The bottom line: Whilst nowhere near as good as Planet of the Apes, Beneath the Planet of the Apes is still an entertaining and action-packed sequel that’s worth a look. Brent (James Franciscus) and Nova (Linda Harrison) venture below the surface in ‘Beneath the Planet of the Apes’. 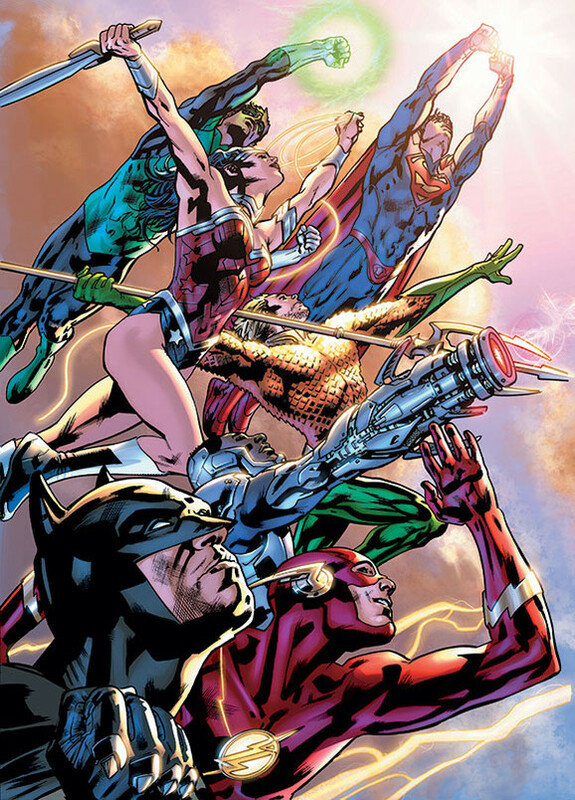 This week saw the launch of DC Comics’ much hyped (and equally anticipated) new Justice League title, Justice League of America from comics uber legend Bryan Hitch. Best known for his collaboration, as artist, with writer Mark Millar on The Ultimates – the celebrated and influential reimagining of Marvel’s Avengers – Hitch now brings his talents as both penciller (aided by inks from Andrew Currie, Daniel Henriques and Wade von Grawbadger) and writer to the DC Comics Universe. Reportedly years in the planning and not to be confused with DC’s short-lived New 52 Justice League spin-off of the same title, Bryan Hitch’s Justice League of America kicks off with a an extra-sized premiere issue that strikes an effective balance between character, story and epic action. Titles from a single writer/artist have often been middling at best (Tony Daniel’s creatively flawed run on Detective Comics springs to mind, as does David Finch’s now defunct Batman: The Dark Knight) yet overall, Hitch has managed to deliver a solid first issue. Whilst this issue largely focuses on Superman and the shocking discoveries he makes at the mysterious Infinity Corporation it’s not long before the Man of Steel is united with Batman, Green Lantern, Flash, Wonder Woman and Cyborg to face the threat of an overpowered and oversized version of Parasite. That just leaves Aquaman, who has his own separate sub-story focusing on tensions between the mainland and Atlantis that will no doubt have some bearing on what’s to come in subsequent issues. Hitch is an effective storyteller, as a writer he adeptly builds the foundations of the story and its unfolding mystery and for the most part accurately captures the voices of the central DC Comics heroes as well as delivering the epic widescreen visuals and action that will both delight and excite readers. It’s an unenviable and herculean task but, the odd character niggle (there are brief moments where Batman seems a little too maniacal) and artistic ‘glitch’ (the odd weakness in Hitch’s figure work/character facials), Hitch generally pulls it off. It doesn’t quite hit the heights of Throne of Atlantis but it’s more than commendable and far above your average superhero comic. The undisputed talents of Bryan Hitch aside, what’s great about Justice League of America is its accessibility. Whilst running concurrently with Geoff Johns’ main Justice League book, Hitch’s title isn’t too entrenched in the continuity of the ongoing events of the wider DC Universe making it easy for new readers (or those who are somewhat behind with DC’s ‘New 52’, like myself) to get on board and enjoy these characters and a decently entertaining, action packed superhero yarn – here’s hoping Hitch can maintain the quality and, perhaps even surpass it, in issues to come. The bottom line: Bryan Hitch’s Justice League of America is off to a promising start with an exciting and epic premiere issue that’s sure to entice readers enough to come back for more. Justice League of America #1 is published by DC Comics and is available in print and digital formats now. Cover art by Bryan Hitch for DC Comics’ ‘Justice League of America’ #1. For audiences of a certain generation, the summer of 1993 stands as a defining moment in cinema, a time when they found themselves captivated and enthralled by Steven Spielberg’s Jurassic Park – a film that was marketed as “65 million years in the making”. Now, 22 years after the release of Spielberg’s landmark production (and fourteen after the lacklustre Jurassic Park III) arrives Jurassic World, the sequel it almost feels as though we’ve been waiting 65 million years to see. Skilfully handled by director Colin Trevorrow (Safety Not Guaranteed), Jurassic World captures the magic of summer 1993, encapsulating all of the thrills and excitement of Jurassic Park, whilst ensuring the demands of a modern blockbuster are carefully met. Given the advancement in digital effects technology and larger production budgets commanded by today’s blockbusters, Jurassic World is presented on an appreciably larger scale in comparison to the original Jurassic Park – which in 1993 was as big as any film could ever hope to be. This is a visually spectacular film, with digital elements combined with practical sets and real environments, all melding seamlessly together to bring the various areas of Isla Nublar and its prehistoric attractions to life. With their being very little in the way of animatronic effects on display, Jurassic World relies heavily on digital effects to create it’s genetically engineered dinosaurs and luckily they appear far better than those initial trailers suggested, being of a quality comparable to any of today’s effects laden cinematic behemoths. All the old favourites return from Velociraptors and Triceratops, to Pterodactyls and the mighty Tyrannosaurus rex, yet Jurassic World’s biggest and most impressive creation is the park’s newest ‘attraction’, the ominously named Indominous rex which the park’s scientists (lead by BD Wong, reprising his Jurassic Park role) have created from the genes of various other dinosaur breeds. The Indominous proves to be as cunning as it is lethal and an animal that doesn’t intend to be caged, unleashing edge-of-the-seat chaos as it escapes captivity to carve a path of death and destruction across Isla Nublar. Leading the human cast of Jurassic World are Terminator Salvation’s Bryce Dallas Howard as Claire Dearing, the park’s chief of operations and Guardians of the Galaxy’s Chris Pratt (further proving he’s an ideal candidate for that inevitable Indiana Jones reboot) as Owen Grady, the park’s dino-wrangler and alpha male to a pack of Velociraptors he’s been charged with ‘training’. Both are great in their respective roles and share great chemistry with Howard as the strong willed women of the corporate world and Pratt as the skilled swashbuckling hero – there have been criticisms of sexism levelled here but Howard’s role branches beyond merely establishing a romantic sub-plot and is afforded plenty of opportunity to demonstrate she’s just as capable as Pratt in the action stakes. Ty Simpkins (previously seen teaming up with Robert Downey Jr in Iron Man 3) and Nick Robinson are also fairly well presented as Claire’s visiting nephews, chases frantically ensuing as they become lost deep within the park as the chaos unfolds, whilst Vincent D’Onofrio’s security chief seeks to manipulate events to his own benefit. 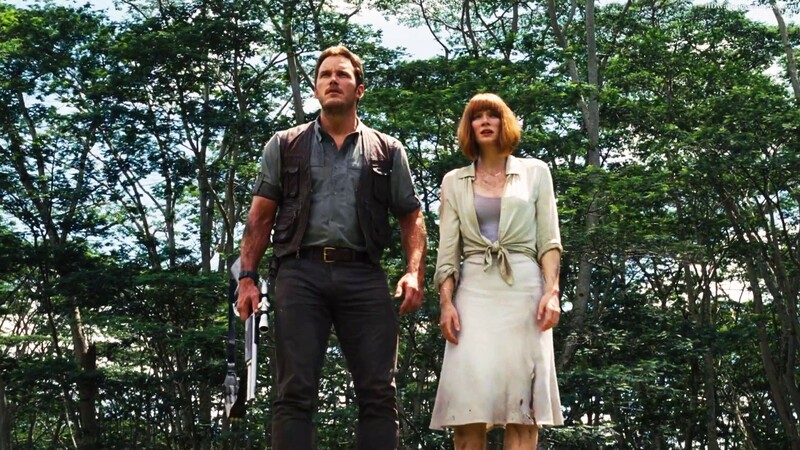 Amongst all of the blockbuster action and excitement (and a smattering of humour for good measure) there are ethical themes of man interfering with nature present in Jurassic World which, just like Jurassic Park, are handled intelligently (even Grady’s training of raptors, which could have easily been one of the more outlandish elements, seems fairly plausible), without placing too much burden on the audience. There’s also some welcome self-deprecating cynicism with jibes at brand sponsorship and other corporate sensibilities in creating the next “thing” that’s bigger, better and “cooler”. With numerous nods and winks to Jurassic Park laced throughout and John Williams’ themes incorporated into Michael Giacchino’s exciting score, Jurassic World comes with a healthy dose of nostalgia yet it feels as fresh and as relevant as Spielberg’s film did in 1993 and is sure to appeal to cinema goers of all ages. The bottom line: Jurassic World is a visually impressive and intelligently executed blockbuster that returns the Jurassic Park franchise to its former glory with a strong leading cast successfully balanced against blockbuster action and an impressive array of CGI creatures. Chris Pratt and Bryce Dallas Howard are the heroic leads in the long awaited ‘Jurassic World’.